"Green is the New Black at HAMC"
Joy Sussman is a former advertising creative director, marketing director, and public relations executive who now channels her experience into environmental projects and marketing programs for the school. * I Am Available to Mentor Other Green School Honor Roll Members. The idea for our school's Green Team originated at a casual dinner with friends, one of whom was on the school board. We were discussing how one child whose parent packs a juice box every day for school is throwing out approximately 175 juice boxes in one school year--so in our small school, we were getting into the THOUSANDS for juice boxes thrown out by our kindergarten class alone in one school year. Juice boxes take literally hundreds of years to disintegrate, so for one little box that gets a couple of sips and (often) the rest of its contents spilled down the front of the child, it has a disproportionately long life on earth. If the parent replaced the juice box with a reusable thermos (possibly offered in a fundraising sale with the school logo), one student alone would be making a measurable difference towards reducing landfill waste. This juice box conversation led to discussion of forming an environmental team at the school, which led to meetings with the school administrators, all of whom were incredibly supportive and enthusiastic about greening the school to a much larger extent. This is, in part, because environmental efforts dovetail with one of the school's core Jewish values, Tikkun Olam, or "repairing the world." During late summer, our school sent an email letter from the Green Team to parents, encouraging them to pack thermoses instead of juice boxes and detailing the reasons and benefits. We also launched the Green Team and set up an agenda for the year. One of our biggest achievements was instituting a comprehensive recycling program at our school. There are now separate bins in each classroom for mixed paper and garbage, as well as bottle/can recycling in the lunchroom and staff rooms. Field trips at our school usually came with the directive to "pack a fully disposable lunch for your child." However, it seemed counter-intuitive to visit a lovely place and leave behind a bunch of garbage bags for our hosts. Therefore, on a field trip to a local farm, a Green Team member accompanied the students to help distribute the regular lunch boxes and take them all back to the school after the trip. We further reduced waste at the school by ordering biodegradable cups, plates, and utensils from World Centric for school lunches that are delivered to the classrooms of the younger students. The school already uses regular plates, glasses, and utensils for the older students' lunches and washes those items in an energy-efficient dishwasher. The school already has a greenhouse and the science teachers incorporate hands-on lessons for the children. The school also has increased its paperless communications, favoring emails and encouraging visits to the school web site for parent information. The Green Team also participated in a webinar for guidance on how to green the school, conducted by the Jewish National Fund and Greenfaith. A "green basket" full of eco-friendly items was contributed to one of the school's largest fundraisers, the fashion show & silent auction. We instituted a crayon recycling program at the school, which is ongoing. For the educational component of greening the school, we brought in outside experts (rabbis) to present musical shows for the younger students and interactive discussions for the older students. We put a "No Idling Zone" plan into place for the next school year, with a spring banner contest to end the 2010-11 school year. We use green cleaners at our school to avoid toxicity issues and provide cleaner air. Concerned parents along with the enthusiastic support of administrators and teachers, custodial staff, and lunchroom coordinators. Naomi Bacharach, our school's Director of Marketing and Development, is our key liaison to our school administration and has been enormously helpful and supportive to our Green Team. Our Head of School, Moshe Vaknin; our Dean of General Studies, Dr. Cheryl Bahar; and our Director of Operations, Jill Granik, have also been ongoing and vocal supporters of our efforts. Our Head Custodian, William Kellar, also is instrumental to many aspects of greening our school. We held a "No Idling Zone" banner contest. The two winners (tied) had their work turned into a banner to hang on our playground fence to remind parents to turn off their engines while they wait--especially because the pick-up line is right next to our playground. We enlisted guest rabbis to give high-spirited musical presentations for the youngest students and interactive discussions with the oldest students. 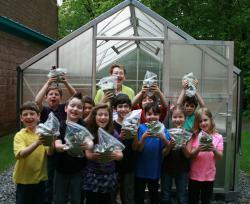 We held an Earth Day, in which the students engaged in eco-friendly crafts, greenhouse projects, and bulb-planting. We held a year-long crayon recycling program that encouraged students and teachers to donate their old, broken crayons. An after-school enrichment class, led by a Green Team member and entitled "Go Geography! ", highlighted endangered species around the world, served organic snacks, and pooled funds for charity. We began greening our school during the summer of 2010 and our activities have had "snowball momentum." Each idea seems to grow into a bigger idea. Each achievement builds on itself--it is empowering to realize that greener, safer, healthier changes can indeed be made at our school, and smaller changes pave the way for larger ones. -- Composting lunchroom waste in the newly purchased ComposTumbler. -- Expanding the "no styrofoam or plastic cups, plates, and utensils" to all school events. -- Bringing in more special guests to tie together environmental messages with Judaic values, especially Tikkun Olam, "repairing the world." -- Presenting special gifts to each teacher for the start of the school year: green-themed books, age-appropriate to their students, to use however they see fit (for storytimes, lesson plans, or simply to add to their classroom bookshelf for casual browsing). -- Exploring fundraising opportunities (with eco-friendly goods) to develop a "Green Team Nest Egg" for future purchases and activities. -- Coordinating a fall poster contest for students to encourage litter pick-up on school grounds and beyond. Theme: "Please Help Keep Our Green School Clean!" Designating Green Captains--students, possibly from Student Council, who can help oversee green efforts at the school. Encouraging eco-friendly crafts and supplies for school projects. Outline your agenda and take it in steps, with the awareness that it may not be easy or even possible to have 100% enthusiasm or compliance among parents, but celebrate (and publicize) the green differences you have made--large and small. The easiest things to accomplish are the ones that are FREE. Encourage changes instead of legislating them. Most of our programs that involve students are optional and extra-curricular (aside from the guest speakers/rabbis that are an enjoyable and educational part of the school day). We were (and remain) very careful not to interfere with the already-packed school curriculum, but instead are helping the school to truly become a safer, healthier facility for the children and staff. World Centric for biodegradable, compostable plates, cups, and utensils. Photographer Chris Jordan's "Intolerable Beauty: Portraits of American Mass Consumption" and "Running the Numbers: An American Self-Portrait"
Living Like Ed: A Guide to the Eco-Friendly Life by Ed Begley, Jr.